All Gilbert and Sullivan scholars know the story of the ‘discovery’ of the to-be-famous George Grossmith, and his installation as the star comedian of the Opera Comique and then the Savoy Theatres … It was one of those twists of casting fate so frequently to be found in the history of the theatre. But what might have happened had W S Gilbert not popped into that minor production of Trial by Jury and seen Grossmith…? 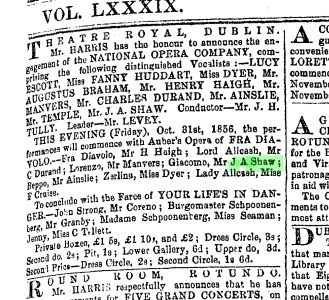 It might have been John Shaw who became the star of the Savoy..
Mr J A Shaw is one of those performers who is remembered – when he is remembered – for just one part. Which is, in his case, a little unfair. Or just, perhaps, a little unlucky. John Shaw described himself as ‘musician and comedian’ rather than ‘vocalist’, and in comparison with most of the other artists who appear in this collection, he was undoubtedly right. Of the two performers to whom he may be most readily compared, he seemingly had rather less of a voice than John Parry, but rather more than Mr George Grossmith, the man who ended up garnering the celebrated roles and the vast success which might have been John Shaw’s, had his luck and his life held out. John Shaw was born in Bethnal Green, the son of William Joseph Shaw (21 May 1793-1877) and his wife Ann, née Keates (m Greyfriars, 24 September 1815). William can be seen in the British censi working as a silk weaver (1841), a carpet warehouseman (1851) and a plain warehouseman (1861); sister Sarah is a dressmaker, and John, from number 3 Hope Street, Bethnal Green, in 1851, declares himself already ‘musician’. 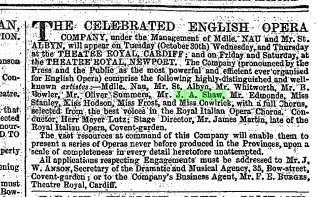 It seems as though his early musical life was that of an operatic chorister, but since he initially worked just as plain ‘Mr Shaw’ tracking down such engagements is a little difficult. It is only when he decides to become ‘Mr J A Shaw’ (the ‘Alexander’ seemingly plucked from the air) that he comes more easily to view. That expansion seems to have come about in 1855, when he turns up playing small parts and comic afterpieces with the Nau and St Albyn company on their operatic tour of Britain. I think, however, he may have been attached to such companies for some time, as when Mlle Nau appeared at the Surrey Theatre, a full five years earlier, as Lucia di Lammermoor, the little role of Lockhart was credited to one ‘Mr Shaw’. In 1856, he can be seen fulfilling a similar role – alongside such other top acting vocalists, Charles Lyall and Henry Horncastle -- in the opera troupe run by J H Tully and Frederic Kingsbury, appearing in No Song, No Supper, Love in a Village, Swiss Swains, as Nicholas in Mischief Making, as Robin in The Watermanand supporting roles in other main pieces (Giacomo in Fra Diavolo,Killian in Der Freischütz, Dominie Sampsonin Guy Mannering), through long tours up to 1858. In 1859, he was among the supporting cast when Kingsbury staged his bid to launch Clara St Casse as an operatic star in Maritana (Lyceum, 4 April). 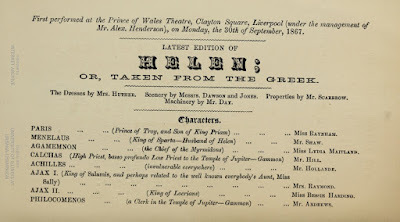 At some stage, he apparently appeared at the Princess’s Theatre and at the Lyceum in some capacity, but I pick him up next at Drury Lane, at Christmas of 1862, playing the little part of the squire’s henchman, Graspall, in the pantomime of Little Goody Two-Shoes, alongside Lydia Thompson, and picking up the notices as a ‘daft good-natured creature’ named Daft Davie in Edmund Falconer’s Scots spectacular Bonnie Dundee(‘the character which stood out most strongly was Daft Davie played by Mr J A Shaw’). 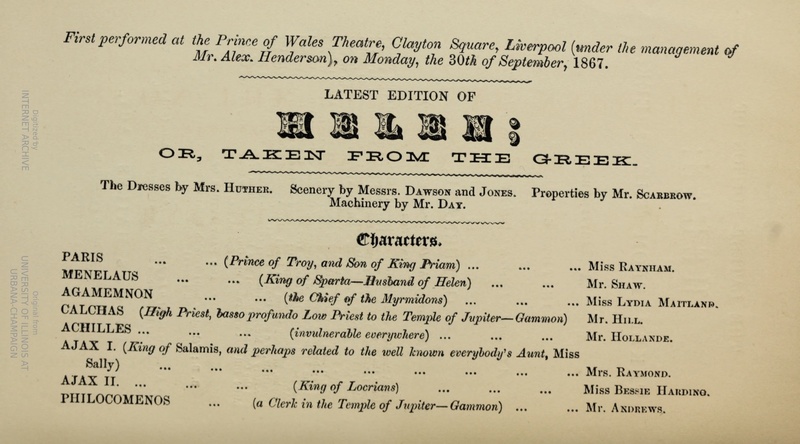 Later in 1863, he turns up at Hull, playing with Sophie Oesten as Adolphus Adorham in an operetta Married Maidenscomposed by local musician Dr Harry Deval RAM. The other side of John Shaw glimpses through when, on the occasion of the Actors’ Shakespeare Supper at the Freemasons Tavern (22 April 1864), he is seen in charge of the musical part of the performance. Charles Santley top-billed, and such well-known operatic and concert artists as Aynsley Cook, Distin, Patey, Tedder, John Rouse, Perren, and Bowler joined Shaw in glees and choruses. During 1865, John Shaw appeared at the Gallery in four further drawing room operettas: A Fair Exchange, Ching Chow Hi, Widows Bewitched and Love Wins the Way, before, on 11 November, this particular episode in the career of the Reeds came to an end. Shaw went back on the operatic road, playing comedy and afterpieces with Charles Durand, but he was soon back in London, engaged as a member of the company at the Adelphi Theatre. There, he created the role of the yokel Kester Chedzoy in Tom Taylor’s A Sheep in Wolf’s Clothing, the dual role of Blaise (aged 20 and 40) in Victorine, and Ashley in A Sister’s Penance, and most significantly, took the part of Menelaus in one of the first British attempts to play genuine French opéra-bouffe: a rather ham-fisted version of La Belle Hélène, entitled Helen, or Taken from the Greek. The author of the adaptation was Mr F C Burnand. 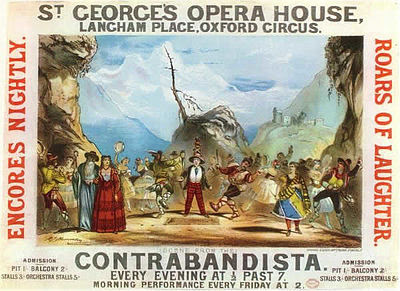 Twelve months later, an attempt at English opéra-bouffe, The Contrabandista, authored by the same Mr Burnand, music by Mr Arthur Sullivan, was produced by the German Reeds at St George’s Hall and, logically, the principal comic role – which was, indeed, the ‘star’ role of the opera, was entrusted to John Shaw. And he made a notable hit: ‘The life and soul of the piece is Mr J A Shaw whose performances in Macfarren’s operetta The Soldier’s Legacyhad already made him a favourite with the public at the Gallery of Illustration. This gentleman’s impersonation of Mr Grigg is distinguished by humour of the right sort; and if he had been blessed with anything resembling a voice he would shine no less as a singer than as an actor. Grigg is a sharply defined character in his hands and he delivers his principal song (‘From Rock to Rock’) – all his music indeed – with a point and intelligence for the secret of which many a dramatic singer, gifted with a voice, might profitably barter that voice in exchange’. Thus, John Shaw – as Adolphus Grigg in The Contrabandista– arguably set the pattern for the long series of comical, patter-singing, leading characters which would become a British institution as created in the comic operas of Sullivan and W S Gilbert by George Grossmith. The German Reeds, however, did not follow up their experiment in English opéra-bouffe, and in the dozen years of career that followed, John Shaw never found another role like Mr Grigg, the comical little photographer lost in musical banditti-land. He played endless performances in the role of Cox in Sullivan and Burnand’s Cox and Box, from on end of the country to the other, and in several London productions, he took Thomas German Reed’s place in the new-style Reed entertainment when, in 1871, that gentleman was laid low by a riding accident, and he took part in operettas and English adaptations of opéra-bouffe at the Royalty (Paquita), the St James’s (The Bridge of Sighs), the Opera Comique (Sir Richard Robin in Little Tom Tug), and the Philharmonic (the Duke in Geneviève de Brabantrevival, 1878). He went on tour in a minor company of La Fille de Madame Angot(1875) with which he created the English version of the role of Ka-o-lin in Fleur de thé. but the fame of a Parry or a Grossmith, or indeed of a Charles Lyall, curiously and maybe unfairly, eluded him. My last sightings of John Shaw as a performer are in August 1879, when he is playing – still – Cox and Box, The Rose of the Auvergneet al with a little drawing room company led by Alice Barth and Edward Cotte, in the London suburbs, and in December of the same year when he played with the Vokes Family in the Drury Lane panto Bluebeard. Less than a year later ‘aged 53’, he was dead, the victim – so says his death certificate – of ‘stricture of pyloric of the stomach’. John Shaw published a number of songs during the 1870s (‘Bluebells’, ‘Adieu’ a heart warm fond adieu’) and at one stage it was announced that he had composed an orchestral work to be performed at the Covent Garden Promenade Concerts.